It's Pi Day! It also happens to be a massive snow day here in NYC, and I couldn't imagine a better way to warm up during a blizzard than to crank up the oven. While I woke up with thoughts of golden bread loaves and slurpy slow-cooked soup, this chocolate hazelnut torte is officially making it's way onto my day's agenda. 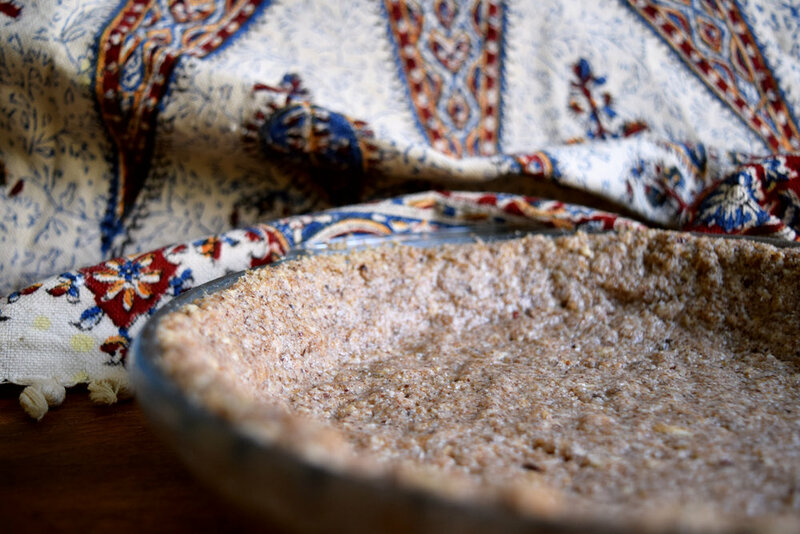 This nutty, unexpected pie is the perfect backup dessert for any season, it fits just as well with warm winter stews and days spent with a cat snuggled in your lap as it does with a pile of spring greens and summer fruits while sunbeams stream through the window. Chocolate, it's seasonless. It also happens to be a big weakness in my family (I don't think the Lessler's are alone in this regard) so watch out, this pie might disappear fast. Thankfully it's a pretty straightforward one to whip up and you probably have the majority of the ingredients hanging out in your pantry already. Even in a blizzard, a skip down to the bodega for hazelnuts is not out of the question. OK I'm going to stop writing about pie now and go do that. I just need to thank the beautiful, talented recipe writer; that French girl Marie who brought us peach almond pie in the summertime is 100% responsible for this delectable treat. Just remember, she's just about as good at following recipes as I am (which is pretty bad, for the record) so take these measurements with a grain of, er, salt, and feel free to adjust as you see fit. Bon Appétit! Prep time: 60 minutes. Cook time: 30 minutes. Grind 1/2 of the hazelnuts in a blender until powdered. Add flour, hazelnut powder and 1/2 of the sugar to a large mixing bowl and incorporate. Add 2 tbsp coconut oil and iced water, adding one tbsp at a time as you mix with a wooden spoon. Dough should form, smooth but a little crumbly. Roll into a ball and refrigerate for 1 hour. Once cooled, roll out as much as possible before pressing dough into the pie dish. Heat oven to 350*F.
Prepare a double boiler by placing a smaller pot inside of a larger one, 1/3 full of water. As the water in the bottom pot boils, the smaller pot will float without touching the bottom of the larger pot. Add chocolate, vanilla and 1 tbsp coconut oil to the small pot and let melt. When chocolate is 1/2 melted, add remaining sugar and maple syrup, stirring as you go. Remove from heat just before all of the chocolate is melted and stir vigorously until smooth (or as smooth as you can get). Add remaining hazelnuts, roughly chopped, to the melted chocolate and mix thoroughly. Add chocolate mixture to the crust, even out with a spatula, then top with more chopped hazelnut pieces. Bake for 20-30 minutes or until the center of the pie settles and the crust is browned. Let cool for 20 minutes, then slice and serve with a generous helping of Luna & Larry's Coconut Bliss Vanilla Island vegan ice cream! This torte is even better served cold the next day. This article is written by Collin Philips and was originally published on Selva Beat, an online, environmental magazine with a strong focus on the palm-oil industry and conflict-free living. Selva Beat will be publishing some farm to table recipes in the upcoming weeks, so be sure to check back for more Farmers Market fun! Image courtesy of Selva Beat. One of my goals this year was to transition to completely local perishables. I made this mostly lofty goal after noticing that the apple I was eating in Houston, Texas was from New Zealand, and possibly over half a year old. To lower my carbon foot print another 4-5%, I would have to eat local and seasonal fruits and veggies. I already make my own vegan dairy like milk and butter and can buy rice, flour, nuts, and legumes at my local grocer or co-op. So, how hard could it be? The market where I live has the best organic fruits and vegetables, most of which I would never see at a national chain grocer. Nothing beats the atmosphere either! But, I have to be realistic about what I can make with what I buy. If you have a routine where you make similar dishes each week, shopping this way may be a little jarring at first. I can always find amazing herbs, gourds, mushrooms, etc but sometimes I can't find good citrus. How does that affect the dishes I will make? Eating this way requires adaptability but thankfully, that is just something that strengthens with time. If you're not great at cooking on the fly, consider buying a seasonal cookbook for your area or city. Here's one just for Connecticut! General farm to table cookbooks are great too but note that most of them are not vegan. If all else fails, food blogs are your friend! Simply put, start out with an open mind and a little patience. If you’re looking to transition your home too, you first have to become well-versed in the farmer’s markets in your city. If you don't know where to start, here is the USDA Farmer's Market Directory. Sometimes googling your 'zip code + farmer's market' is all you need. Chances are your area has more than just one and each is going to have a different array of vendors, some more suited to your needs than others. In Houston, the two I love are only on Saturday and Tuesday. Back in Austin, there was a farmer’s market five days out of the week. All markets have fruits and veggies, most have eggs, meat, fish and cheese, and some have bread loaves and flour, etc. You can also find kombucha, pickled goods, coffee, and likely a variety of food trucks. Make note of your favorite stalls and take a photo of their banner to keep in mind for later (more on this below). Introduce yourself whenever possible, though some stalls get really crazy; how often do you get to say you know the people who grow your food? Okay, so you’ve found the perfect fit for you, and your stomach. Now you need to stay friends. I recommend adding your farmer’s market on Facebook or Twitter, as they’ll likely post tidbits on which vendors will show or highlight certain fruits and veggies (like the best watermelons!). The same goes for your favorite vendor — it’s a real bummer when you really need something special like vegan bread or kombucha and that stall is a no-show. Be the first to know about sick days and early bird specials. The more informed you are, the more positive this process will be and you’ll be less likely to burn out six months down the line. TIP → Scope out each market’s cash or credit options. The markets in the last city I lived in were practically all electronic and card friendly, whereas Urban Harvest, my current beat, leans way more towards cash transactions. It can also get really crowded, so sometimes handing someone a five dollar bill is just more efficient. Read the rest on Selva Beat! Remember my friends Eddie and Chris? Yea, they're good cooks, and, when my apartment is not conducive to food photography, they come to save the day. I think that if we were to share a kitchen, it would be the most perfect place in the world. By the way, this recipe is actually a double. All of you folks with juicers out there, you can do a happy dance. For Eddie and Chris have a golden juice recipe for you AND they have devised a fantastic way to save all the juice pulp from the compost bin. Now your dinner dollars can stretch just a little bit further. Huzzah! Don't fret, though, my non juicing friends. You can definitely still make this soup. Or, bribe your juicey friends for their pulp maybe? Also, dearest vegans, though Eddie and Chris' soup is not compliant, there are some easy, cruelty free, alternatives. Parmesan can easily be omitted or replaced with nutritional yeast, while butter can be replaced with olive oil. Vegan viola! Without further adieu, please enjoy this double recipe by Eddie and Chris! Prep time: 5 minutes. Juice time: 10 minutes. Chop your ingredients into juicer appropriate chunks. Save the pulp. If you aren't cooking with it immediately, it will last in the fridge for a few days, but can also be frozen indefinitely (keep in mind that this will reduce the flavor somewhat). We suggest you drink this first thing in the morning. Mix 1 part Tonic with 2 parts water or coconut water. It will make you poop and feel energized and happy before you start your day! Prep time: 5 minutes. Cook time: 35 minutes. Cut onion and carrots into ½ inch pieces and rough chop garlic cloves. 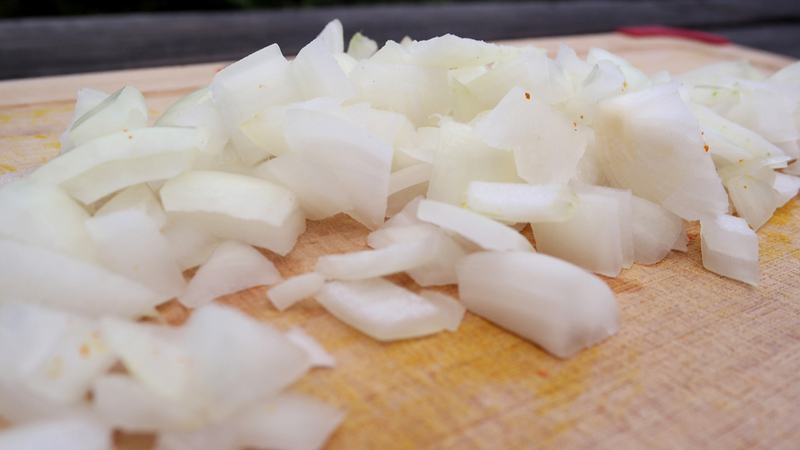 Melt butter in a large pot and add chopped onions. Cook on high, stirring often, until slightly translucent. Add chopped carrots and garlic. Reduce heat to medium and cover the pot with a lid. Combine veggie bouillon with water and set aside. The ginger/turmeric pulp from our Happy Morning Turmeric Tonic can be substituted with a 1-inch piece of fresh ginger and a 1-inch piece of fresh turmeric. If using fresh ginger and turmeric, chop into small pieces. Add ginger/turmeric along with cumin, cayenne pepper, salt and pepper, and dried basil to the pot. Cook for 1 minute. Add water/bouillon mixture to the pot. Turn heat to high until it boils, then reduce heat to medium. Simmer for 10 minutes. After 10 minutes, transfer content to a blender to puree the soup. You may need to do this a few times, depending on the size of your blender, as well as using a second pot to hold the pureed soup. Once everything has been blended, return to one single pot. Taste and add more salt or pepper, if needed.